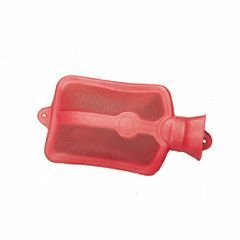 The Hot Water Bottle is a rubber bottle made for pain management and heat therapy. It is puncture resistant and can hold up to 2-quarts of hot water. The rubber coating insulates the water to keep it from cooling off rapidly. It features a screw stopper so there is no chance that water will leak out. This is perfect for every day use to help increase blood flow to painful areas of the body. Good hot water bottle for bed in winter. just the right product for me!!! Easy Storage. Safe. Sturdy. Lightweight. convinient. easy to use. IT IS EASY TO USE AND RETAINS HEAT LONGER THAT OTHER PRODUCTS. Easy Storage. Safe. Sturdy. Lightweight. best I have come across. Could be little bit figge. Could be bigger in cap. back pain & kidney proble. My hot water bag strongly smells (syntehectic or/and plastic. Is this hot water bag odorless? What is difference between hospital grade and premium hot water bottles.